The consumer price index was pushed down in November by falling gas prices. According to the latest release from the Bureau of Labor Statistics (BLS) the consumer price index declined 0.3% on a seasonally adjusted month-over-month basis. Over the past twelve months, prices on expenditures made by urban consumers increased 1.3% before seasonal adjustments. 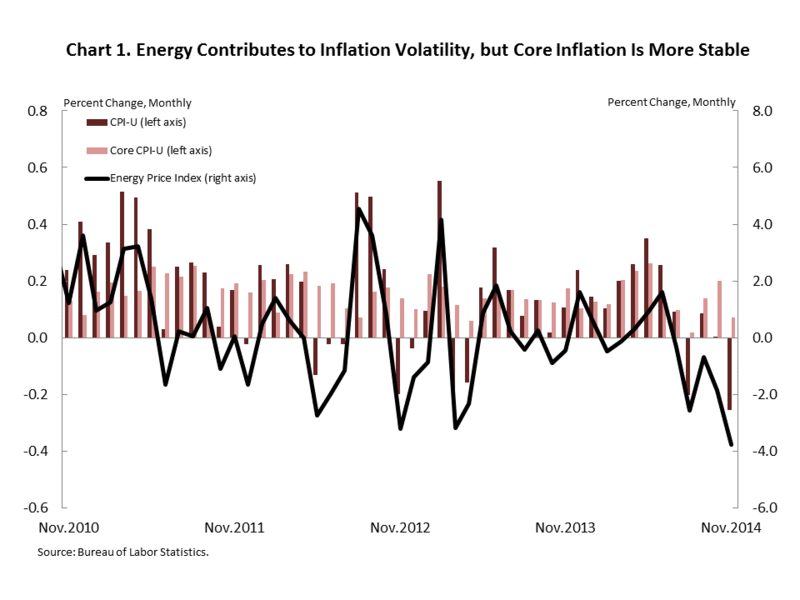 In November, the energy price index fell 3.8% for the month. This marks the fifth consecutive month-over-month decline. The gasoline index, a component of the energy price index, fell 6.6% for the month and is down 10.5% for the year. The index for natural gas also fell for the month, dropping 1.7% on a seasonally adjusted month-over-month basis. Over the past twelve months the food index increased 3.2% before seasonal adjustments. The food index increased 0.2% on a seasonally adjusted month-over-month basis. All components of the food index increased for the year with the largest increase (9.1%) coming from meats, poultry, fish, and eggs. Core CPI, which excludes the more volatile food and energy prices, increased 1.7% over the past twelve months before seasonal adjustments. Core CPI rose 0.1% on a seasonally adjusted month-over-month basis. The shelter index rose 0.3% month-over-month in November after increasing 0.2% month-over-month in October. Over the past twelve months, the shelter index increased 3.0% before seasonal adjustments. The increase in the shelter index partly reflects increases in rental prices; the BLS measure does not isolate the change in rental prices from the changes in the overall price index. NAHB constructs a real price index by deflating the price index for rent by the index for overall inflation. This measure indicates whether inflation in rents is faster or slower than general inflation and provides insight into the supply and demand conditions for rental housing, after controlling for overall inflation. 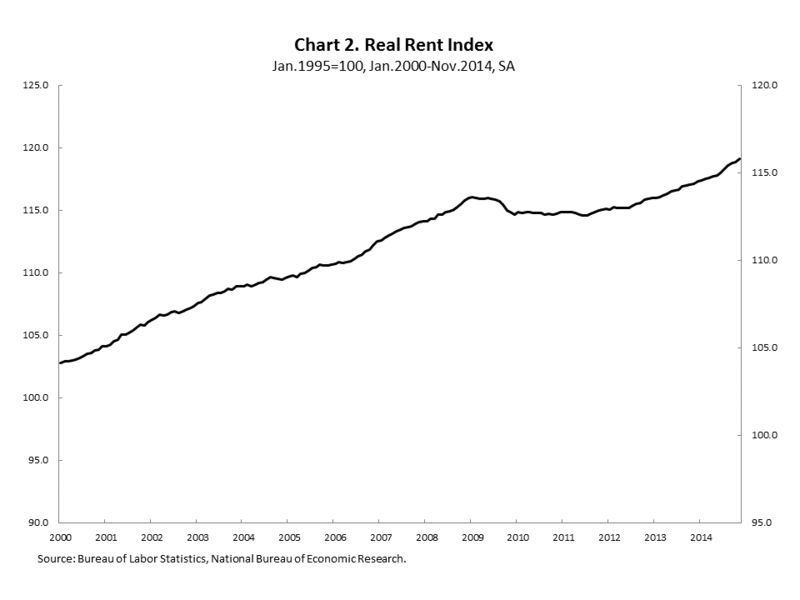 When rents are rising faster (slower) than general inflation the real rent index rises (declines). The NAHB constructed real rent index increased 0.3% month-over-month. Over the past year growth in real rental prices outpaced growth in the CPI. Real rental prices rose by 1.7% from November 2013.